Function: Boosts and Regenerates Skin. NOTE: NOT ADVISABLE TO BE USE BY PREGNANT WOMEN. If you happened to know about these two ingredients you can just scroll down below or leave any comment to add up. more information. For CO Q10 or Co- enzyme Q10. COQ10 give balance moisturiser into our skin, it’s good for all skin type. COQ10 in ingredient is known as ubiquinone, it is a vitamin-like, fat-soluble substance naturally present in the body. A handful of studies have shown that coenzyme Q10 (CoQ10) may help improve the appearance of signs of aging, work as antioxidant and give skin-soothing effects (paulachoice.com). I have used Rosehip Seed oil from the Ordinary skincare and did made the review. This is the only oil that is suitable for my skin. If you happened to suffer from very dry skin or chronic dry skin, I am not gonna recommend the use if Rosehip instead I recommend you to use oil that contain Omega 6 and 9, this can be found in Drunk Elephant Virgin Luxury Marula Oil. The oil has been proven to solve dry skin without any skin problem. How to use face oils: always use at the end of all your skincare. Aqua (Water), Glycerin, Cetyl Alcohol, Stearyl Alcohol, Caprylic/Capric Triglyceride, Panthenol (Vitamin B5), Sodium Ascorbyl Phosphate, Hydrogenated Retinol, Tocopheryl Acetate (Vitamin E), Sodium Stearoyl Glutamate, Camellia Sinensis Leaf Extract, Citrus Reticulata (Mandarin) Peel Oil, Phenoxyethanol, Benzyl Alcohol, Xanthan Gum, Ubiquinone, Folic Acid, Nicotinamide, Citric Acid, Dehydroacetic Acid. Read more about the benefit of the ingredient in BOLD on Glossary. You apply a little bit after using hyaluronic acid into your face. After you use the face cream, for dry to very dry skin, you can use Marula oil. I recommend to use Marula oil for dry to chronic dry skin, especially during winter time instead of Rosehip even thou in previous article I did recommend to use Rosehip oil, also don’t forget to use Facial essence. Counter balance skin moist. 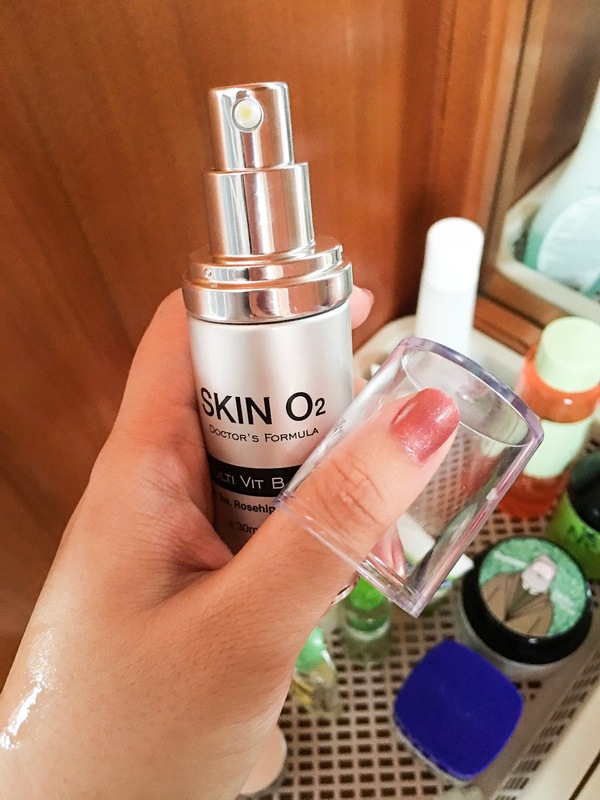 The container that hold is in stainless steel bottle with pumped applicator, one pump is enough for my whole face, it’s recommended to use as enough as possible but not too much. There is a cap that protect the applicator. Easy to carry during travel since the size of the bottle is not too big yet not too small. the face cream is yellow in color but its not contained any color ingredients, I guess this is because the Vitamin C ingredients contained in the cream. Is it animal cruelty free brand or NOT? Does it sold in territories that do the testing? Yes. It’s against animal cruelty. How does it smell? Smell orange and citrus. Have you try Skin O2 Multivit moisturiser yet? Spill some tea on comment and don;t forget use my coupon during check out!